“District Swimmers Race as Beach Opens,” Histories of the National Mall, accessed April 22, 2019, http://mallhistory.org/items/show/170. 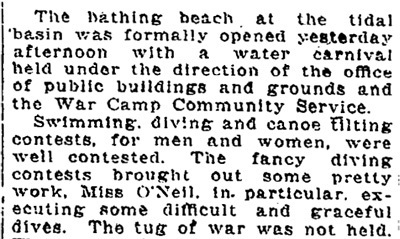 The city office of public buildings and grounds, who operated the site, held a carnival to celebrate the opening of a formal bathing beach at the Tidal Basin. The beach included buildings for changing and a shelter. It was segregated, open only to white residents and visitors. African Americans in the city used other areas, without facilities, in the Anacostia and Potomac Rivers. The bathing beach at the tidal basin was formally opened yesterday afternoon with a water carnival held under the direction of the office of public buildings and grounds and the War Camp Community Service. Swimming, diving and canoe tilting contests, for men and women, were well contested. The fancy diving contests brought out some pretty work. Miss O'Neil, in particular, executing some difficult and graceful dives. The tug of war was not held.